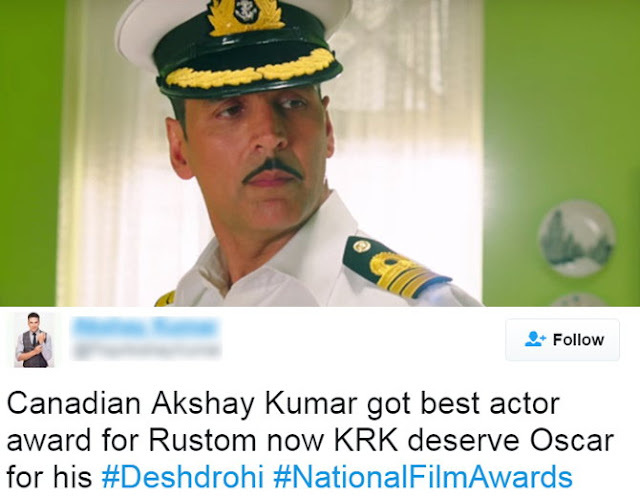 The Bollywood Actor Akshay Kumar won the Best Actor award at the 64th National Film Awards 2017 and while the superstar and his fans are elated over the victory, there are others who thought Akshay Kumar wasn’t deserving enough to win the award for Rustom Movie. Soon after the 64th National Film Awards Winners List announcement, Akshay Kumar gets trolled on Twitter for winning National Award, claiming that Aamir Khan should have bagged the award for Dangal Movie. Many have also questioned as to why Manoj Bajpayee’s performance in Aligarh and Randeep Hooda’s in Sarbjit were snubbed by the jury members of the National Film Award. It is no secret that Akshay is not a very keen patron of award shows and that he was not given a nomination in Filmfare Awards. Many on social media pointed out how Aamir’s performance in ‘Dangal’ was more worthy of the award. Meanwhile, Akshay Kumar posted a video on his social media page thanking his fans for the love and support and for making Rustom such a big success. This is the first time Akshay Kumar in his 26 years of career won National Award for Best Actor. His wife Twinkle Khanna also posted an emotional message praising the actor. Minfaz K‏: Clearly biased when #AkshayKumar for Rustom wins the award over #AamirKhan for Dangal. Do we even need a survey to find the better one? suraj the Wankhede: #NationalAward for best actor to #AkshayKumar in a totally forgettable movie #RUSTOM for the below average performance. kudos to jury..
Sam Sanyal: Toh Safed uniform pehen ne ke liye aur false mooche lagane ke liye shayad milta hoga #NationalAward and that’s why #AkshayKumar got it. Akshay was great but @BajpayeeManoj for Aligarh was most deserving. Everyone knows the reality.